Pizza Hut recently added its augmented reality Deal Jacker app to the app store, specifically to put pressure on a competing pizza chain that “rhymes with shmomino’s.” With the app, users are able to use their phone’s camera to scan deals from Pizza Hut’s rival and see them replaced with Pizza Hut Delivery deals at a better value. For instance, while a competitor might advertise two pizzas for £19.99, the Deal Jacker app can be used to secure a similar deal for just £15. 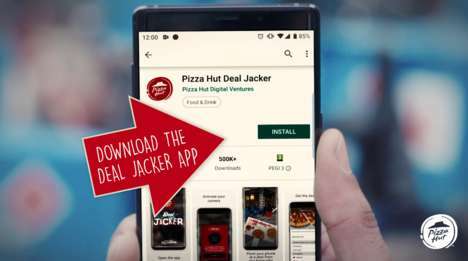 In the case that the Deal Jacker app is unable to recognize a deal, Pizza Hut promises customers 50% off on orders worth £20 or more. With augmented reality, a number of food and beverage brands are playing up longstanding rivalries by launching campaigns that, in one way or another, “destroy” the efforts of a competitor.